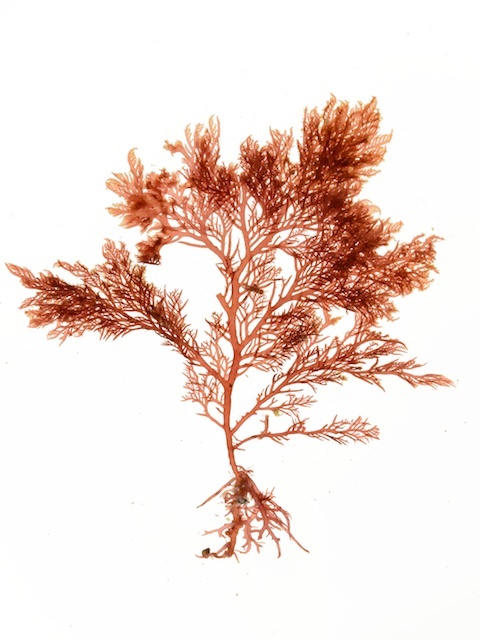 Description: Narrow, compressed, cartilaginous, dull scarlet fronds, mature thallus 30-45 mm long (specimen above to 25 mm), tufted, densely branched upwards. Branching irregularly alternate, pinnules alternately secund in twos to fours. Stongly developed downwardly growing rhizoids. Habitat: On rocks in shallow wave-washed hollows, in overflows from pools, and in sandy shallow pools. 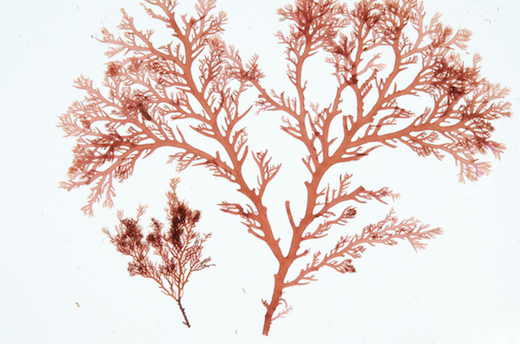 Similar species: Plocamium cartilagineum, of which P. maggsiae looks like a minature version: see below for both species together, P. cartilagineum on right, P. maggsiae on left. Site © M.D. Guiry 2000 - 2019. Important copyright notice: all text, design and photographs on this site are copyrighted by M.D. Guiry unless otherwise stated and all rights are strictly reserved. Click here for copyright information and contact. Website design: 249 Design Studio. Site maintained by M.D. Guiry (michael.guiry@nuigalway.ie). There have been 8724641 page loads since 1 January 2014 on 22 April 2019.